Car exhausts take a beating and it’s unlikely you’ll find a Heinkel that has an original functioning exhaust, or is not sporting a replacement. Unfortunately if you find yourself in need of an exhaust there’s a good chance you’ll have to make some modifications to the exhaust or the bracket in order to get a complete, properly functioning setup. Exhausts from 175 and 200cc cars are not interchangeable without modifications. This is because the exhaust manifolds are different; the 175cc manifold has a drop in it whereas the 200cc is a straight shot to the muffler. 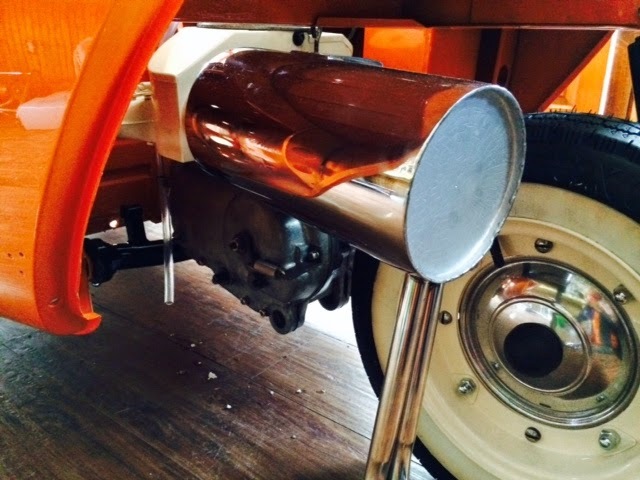 Further compounding the differences are the fact that scooters and cars used 175 cc engines but have different exhausts. The German club 200cc exhaust (“muffler”) fits well, but I’ve had two quality issues with broken or shoddy welding that had to be fixed on two separate occasions. I can’t say that I’m happy with it. The German club does not sell a 175cc car exhaust, but will sell you an alternative that requires modifications. This muffler is the "Holland” muffler used as replacement on Tourist scooters. More about this muffler later. Heinkel Club of UK: They sell a round muffler that fits a 200cc, and an oval that fits a 200cc. I haven’t used either so I can’t comment on them. Since I have a 175 cc I went the buy and modify route. Here’s my story. I had an original 175cc round muffler. 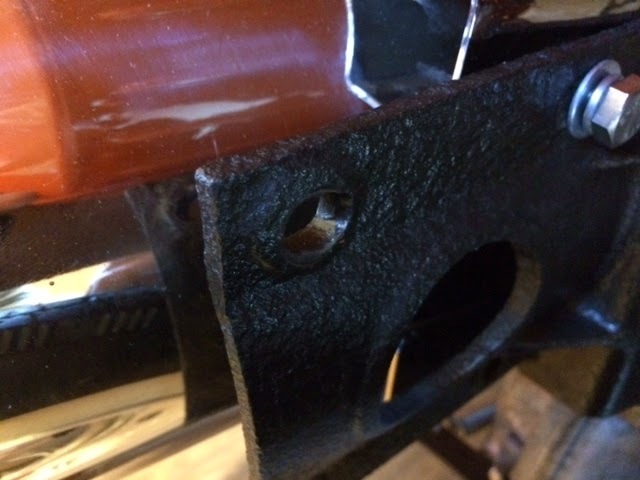 This piece was in poor condition and I attempted to weld it, but between the condition of the part and my novice welding skills it became obvious that I should just buy a new one. I corresponded with the club and they told me they had an acceptable 175 cc substitute that required minor modifications. I think something got lost in Google Translate because when I got the exhaust it was obvious that installing it was not going to be a trivial task. The new muffler did not line up with the 175 bracket. It was misaligned in both the vertical and horizontal dimensions. No amount of reworking the bracket would make it fit. I abandoned that and tried a 200 cc bracket. The 200cc bracket almost fit horizontally, but the vertical dimensions were way off. Once again, with my limited welding skills I was not going to easily arrive at a solution. My only real alternative was to make my own exhaust bracket. The original brackets are cast iron and are pretty tough. The minimum dimensions required to connect all of the holes are 3.5” (90 mm) tall by 2.5” (64mm) wide by 8.25”(211 mm) long. I considered using a piece of steel angle iron, but I could not get such a short piece at a cost effective price. I went to the local lumber yard and stumbled upon the idea of bending metal and laminating enough pieces to get to the desired thickness. I bought a Simpson Strong-Tie “Nail-Stopper” galvanized metal plate for about $5.00 and used this as the basis of my bracket. The only thing I haven’t done is fit a tire. Let’s keep our fingers crossed.